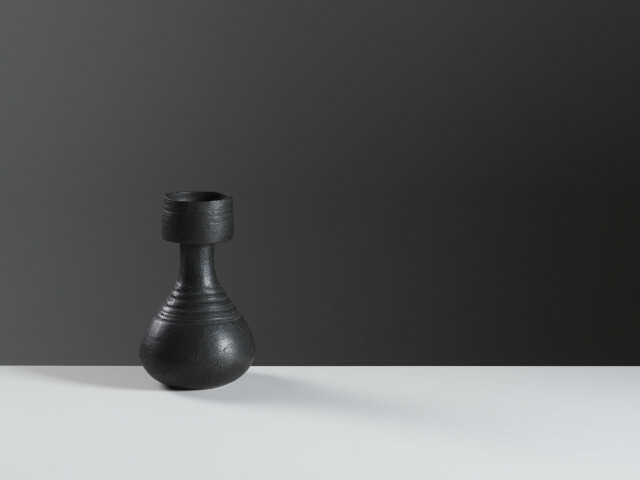 Hans Coper’s thrown and altered vessels, concentrated, precise, superbly balanced and yet full of stilled energy, are amongst the signature forms of modern ceramics. They have taken the language of wheel-made work and containment to another sculptural level, work as much about clay engineering as a vocabulary that appears timeless. Why timeless? Simply because of their economy and concision, their qualities of distilled expansiveness (to border on a contradiction in terms) that carries some of the essence of the earliest vessels and figures (Cycladic forms are often cited) while having a very 20th century consciousness. German-born, Coper (1920-1982) initially came to Britain in 1939, and from 1946 worked with Lucie Rie in her London studio, moving to Hertfordshire in 1958, and subsequently to Somerset. Coper was always interested in structure, eliminating glazes and eventually all surface decoration. His work is often regarded as a modernist alternative to the example of Leach, but ultimately it is self-contained and independent, not part of any school.